Hop-On Hop-Off Bus operating hour vary depending on the line and the season. Orient Line: Every hour from 10.15 to 17.15 - Castle Line: Every 30 minutes from 10.00 to 17.00 - Belem Line: Every 30 minutes from 9.30 to 17.00 – Cascais Line: departures from Lisbon at 10.15 and 15.15, Returns from Cascais at 12.15 and 17.15. Orient Line: every 45 minutes from 9.15 to 18.00 – Castle Line: every 30 minutes from 9.30 to 18.00 – Belem Line: every 25 minutes from 9.00 to 19.00 – Cascais Line: departures from Lisbon at 10.15, 11.15, 12.15, 15.15, 16.15, and 17.15, returns from Cascais at 10.15, 12.15, 13.15, 15.15, 17.15, and 18.30. We are comparing Lisbon Sightseeing Hop-On Hop-Off Tour Prices from leading ticket suppliers and Try to find you Cheap tickets prices on the market. 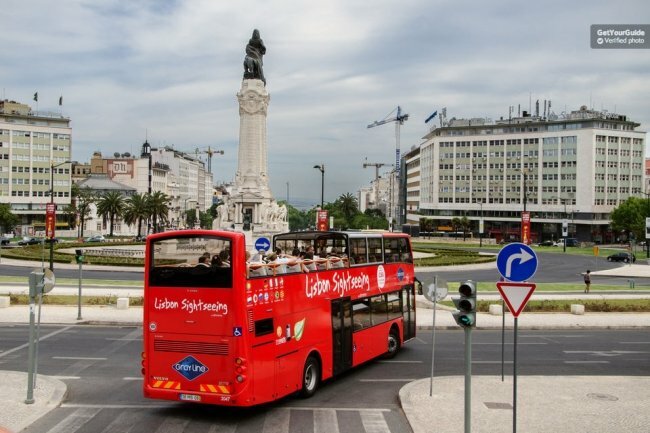 The famous Hop-On Hop-Off double-decker bus is a prominent feature in the city of Lisbon and it's certainly the most convenient way for independent travellers to discover the city. With 3 separate lines taking passengers to different neighbourhood of the city and 1 bonus line connecting Central Lisbon to the seaside town of Cascais via Portugal's Golden Coast, there's certainly something to please every visitor. Hop on or off at any of the marked stops and take advantage of the discounts and special offers available at multiple attraction, museums, restaurants, shops and more. This pass is simple and convenient to use and great value for money. The Hop-On Hop-Off bus experience is aimed at people who would like to travel independently around the city and plan their own itinerary. This is the perfect way for families with children, disabled visors, or those who simply don't like walking to get to Lisbon's many attractions. Your Experience With Lisbon Sightseeing Hop-On Hop-Off Tour? Ride around the city of Lisbon on an iconic open-top sightseeing bus. Hop-On or Hop-Off any of the 4 lines at any of the 54+ marked stops around Lisbon. Learn about the city from the free onboard audio guide and upload your holiday snaps with the free WIFI. Journey through national park to Hell's Mouth on the Lisbon-Cascais line. What Lisbon Sightseeing Hop-On Hop-Off Tour Includes? Unlimited access to all 4 Hop-On Hop-off bus lines for 24 or 48 hours. Free onboard wifi and multilingual audio guide. Information booklet, city map and discounts at many attractions, museums and other venues across the city. Orient Line, 19 stops including Parca das Nacoes (Oceanarium), Water Museum, and Lisbon Zoo. Castle Line, 8 stops including Castle of St George, Tower of Ulysses, and Portas do Sol. Belem Line, 17 stops: Eduardo VII Park, Campo Pequeño, Corte Inglese, Avenida da Liberdade, Cars Museum, Jeronimo's Monastery, Marques de Pombal, Belem Tower, Orient Museum, Estrela Cathedral, Restauradores, Cais do Sodre, Padrao dor Descubrimentos Monument, Rossio, and Saldanha. The Cascais Line will stop in Guincho, Estoril, Cascais, Hell's Mouth, Carcavelos, and Lisbon. Because the Hop-On Hop-Off bus pass covers so many locations, including a line to Cascais, we recommend taking the pass for 48 hours to make the most of your time. Travelers Reviews about Lisbon Sightseeing Hop-On Hop-Off Tour? The Hop-On Hop-Off bus has received mixed reviews on trip advisor, most comments agree that the pass reasonably priced and that it functions well within the city. The main complaints are regarding overcrowding on the buses, something to be expected with such a popular tour, this issue avoided by planning your journey outside of peak hours. Negative comments also mention delays of up to 1 hour on the Cascais line. Printed or electronic vouchers are accepted. Cancellation policies will vary depending on your ticket provider, tickets purchased from Tiqets are non-refundable, Viator will issue full or partial refunds up to 3 days in advance and Get Your Guide will issue full refunds up to 24 hours in advance. Onboard audio guides are available in at least 14 languages, including English, Portuguese, French, Italian, Spanish, Basque, German, Dutch, Greek, Chinese, and Russian. Buses do not operate on New Years Day or Christmas Day.